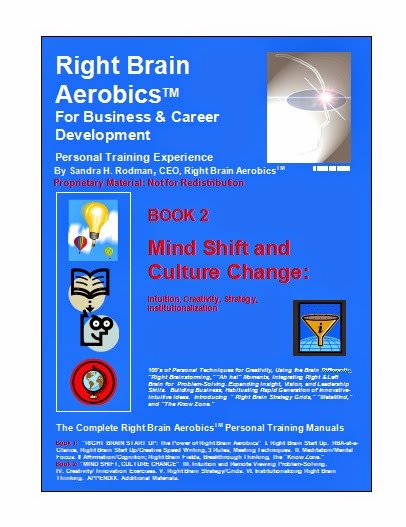 Organizational Training and/or Self-Paced Self-Training Packages (PDFs, Audio, EBooks & more) for Right Brain Aerobics for Innovation & Creativity Training for Business/Career/Personal Development with Sandra H. Rodman, CEO, Right Brain Aerobics and Bill Gallagher, President, Gallagher Management Company. Plus Self-Paced Self-Training Packages which may be purchased and licensed for teams or enterprise. BELOW: Examples of the PDFs, eBooklets, Manuals and Sample Audio File for Self-Training. 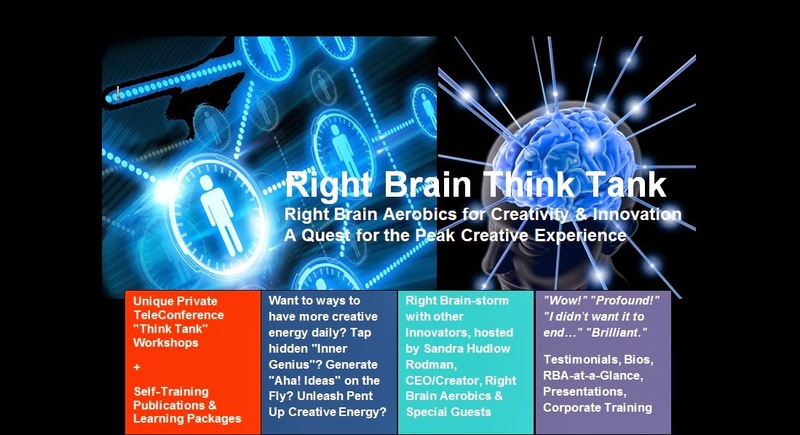 Tiered Pricing Packages are available as they are for Right Brain Think Tank -- which may include Executive, Intermediate, or Level 1 combinations of experiential training + Self-Training Self-Training Packages for the designated # of Licensees at the level desired. 1. Stand-up Instructor-Led Training in person -- Executive and Team training is most effective for groups of 10 - 20; groups of 60-100+ or more may also be trained. Examples of types of interaction. 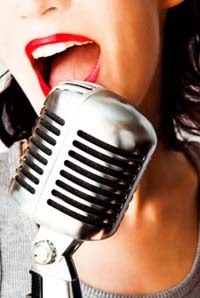 Stand-up Training and Motivational Speaking/Training require travel expenses. RBA Level 1 Training, 4 - 7 hrs depending on goals and program. All 7 Components RBA Training: 1.5 days of Training -- 10 am - 5 pm Day 1, 10 am - 1 pm, Day 2 -- or 2 days of Training. Plus: Self-Training Packages for Licensed employees for ongoing Personal/Career Development chosen from the Package elements offered. Video coming soon. 2. And/or TeleConference Instructor-Led Training. 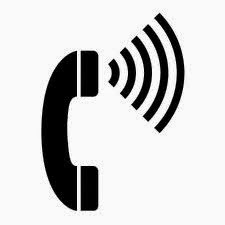 By Telephone, The Executive and Team training is most effective for groups of 10 - 20. However groups of 60-100 or more may also be trained. Examples of types of interaction. RBA Level 1 - Three sessions of 2 hr Conference Calls, usually with 1 week intervening between calls. Remaining RBA Levels: Level 2 -- includes Components 2-4, Level 3 includes Components 5-7 -- each being Three sessions of 2 hr Conference Calls, usually with 1 week intervening between calls. 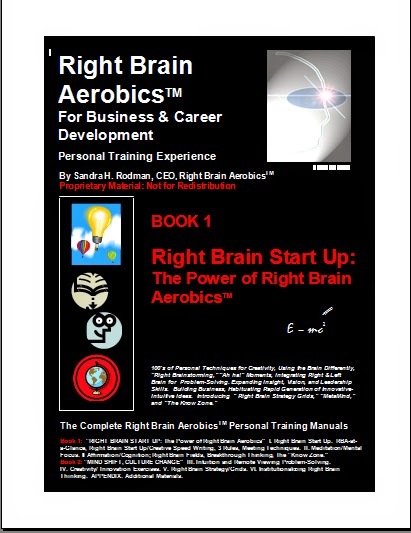 Examples of Self-Training Learning Package PDFs/eBooklets and for Executives Packages, Right Brain Aerobics Manuals, Vol 1 & 2 - 600 Pages -- included in various packages of Right Brain Aerobics and Right Brain Think Tank training. Sample Audio File included, additional to be added. 1000 Year Business Plan blogsite & exercises: A whole new approach to "right brain" long-range business thinking! Right Brain Start Up Audio exercise for deeply relaxed mental focus and creativity -- link/description, below. Just one new "outlier" innovative idea using RBA's creative mind-power creative-intuitive techniques -- ideas "out of the blue" and "ahead of the curve" -- could be worth $ Millions organizationally. "The Innovator's Mind-set... The Innovator's Mind-state -- the core context for Innovation, Entrepreneurship, Startups, and Creative Leadership that works. Yet we do not usually train mind/brain states or 'quantum-leap' thinking." 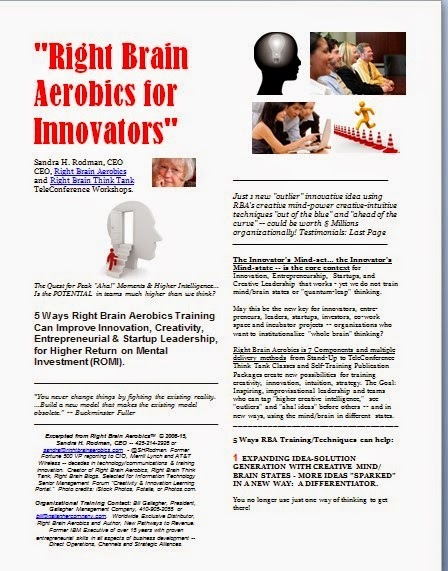 Right Brain Aerobics does -- and Right Brain Think Tank TeleClass session are a way to "right-brainstorm" at new creative levels. Click here. 6 Pages. Check these vectors to see if more strategy variables/innovations are available. Click Here or Request PDF. 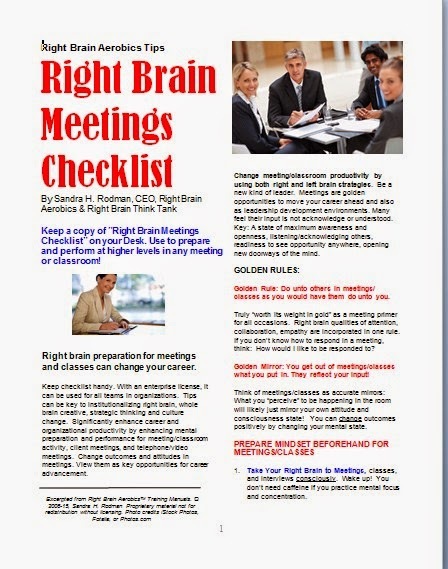 Right brain preparation for meetings and classes can change your career. Keep checklist handy. With an enterprise license, it can be used for all teams in organizations. 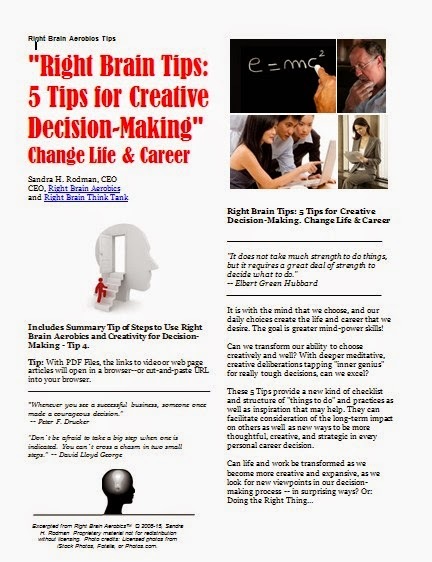 Tips can be key to institutionalizing right brain, whole brain creative, strategic thinking and culture change. Significantly enhance career and organizational productivity by enhancing mental preparation and performance for meeting/classroom activity, client meetings, and telephone/video meetings. Change outcomes and attitudes in meetings. View them as key opportunities for career advancement. Click Here or Request PDF. 6 Pages, 38 Steps and Tips. It is with the mind that we choose, and our daily choices create the life and career that we desire. The goal is greater mind-power skills! Can we transform our ability to choose creatively and well? With deeper meditative, creative deliberations tapping "inner genius" for really tough decisions, can we excel? Includes Summary Tip of Steps to Use Right Brain Aerobics Exercises and Techniques for Creative Decision- Making. Click Here or Request PDF. 7 Pages. Worksheets for comparing current role aspects and creating new roles for life, work, relationships, success. Worksheets accompany the RBA Storyboarding technique to "draw out" plans for new projects, creativity, innovative ideas. The process enables increased clarity and understanding of how we create various levels of performance ourselves -- and how to change them -- becoming our own Creative Director for greater career and life success. From the roles/lines we write that become our career "story" -- to sets, costumes, props: We can recognize how to create a new more effective and affirmative self-image. Click Here or Request PDF. 2 Page Checklist. 6. "Right Brain Strategy Grids: How to Analyze & Synthesize Right and Left Brain Approaches for Whole Brain Thinking." 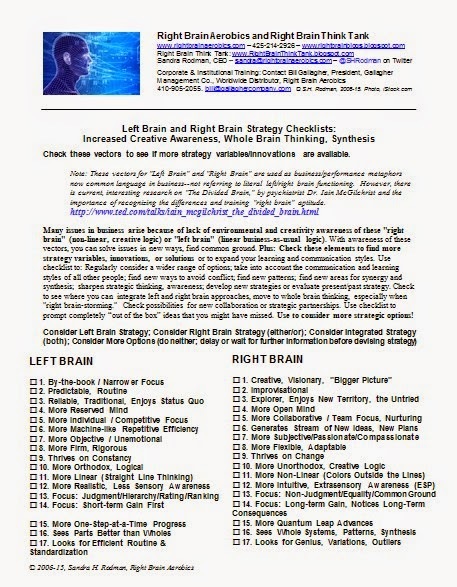 Advanced Right Brain Strategy, Component 6. 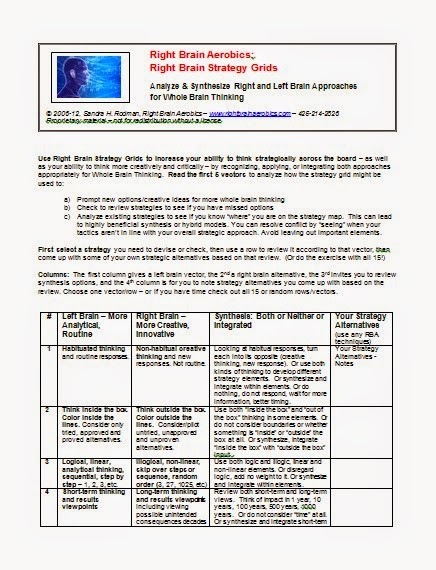 Learn to use Strategy Grids to assess Right Brain and Left Brain Strategy Options as well as analyze, synthesize, choose either-or or neither and integrate. Increase your ability to think strategically across the board--as well as your ability to think more creatively and critically by reconizing, applying strategic approaches. Grid format is very helpful for structured thinking and strategic thinking analysis on any topic. Resolve conflict by "seeing" where your tactics aren't in line with your overall strategic approach. Avoid leaving out important elements. Click Here or Request PDF. 4 Page, 5-Column, 15-Element Strategy Grid. 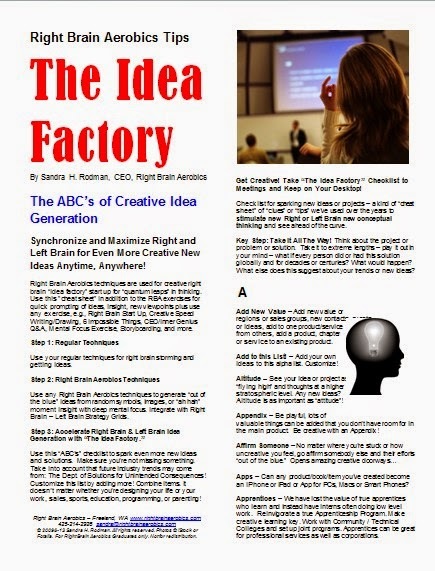 Synchronize and Maximize Right and Left Brain for Even More Creative New Ideas Anytime, Anywhere! Get Creative! Take “The Idea Factory” Checklist to Meetings and Keep on Your Desktop! Click Here or Request PDF. 8 Pages and more than 100 Items from A - Z. "The Idea Factory" Cards will soon be available. 8. 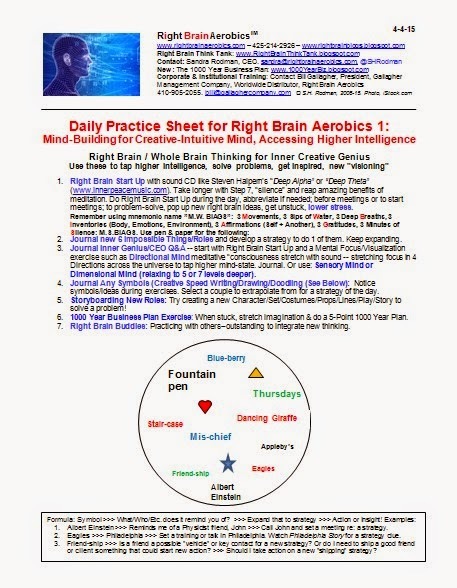 "Right Brain Aerobics: Daily Practice Sheet for RBA Level 1," by S.H. Rodman. Daily Mind-Building for Creative-Intuitive Mind, Accessing Higher Intelligence using Right Brain / Whole Brain Thinking for Inner Creative Genius. Summary of the steps of each of the key Right Brain Aerobics Level 1 exercises/techniques learned in experiential training -- on one sheet for convenience. In addition many PDFs/eBooklets, Manuals, and Audio Files are provided for additional self-training and career development (See Below for Self-Training Package.) Click Here or Request PDF.1-Page Daily Practice Sheet. Created for use by organizations internally to measure progress and allow sharing of valuable innovative ideas produced during training or as staff use RBA for new creative ideas and right brain-storming. Always available online. Extensive articles/blogs and exercises to really stretch right brain thinking and business imagination -- see "ahead of the curve" by creatively looking at "the long view" -- in every division of business. a. Current article: "5 Reasons You Need a Chief Renewables Officer & Chief Tech Trends Officer!" + Right Brain Thinking! 11. 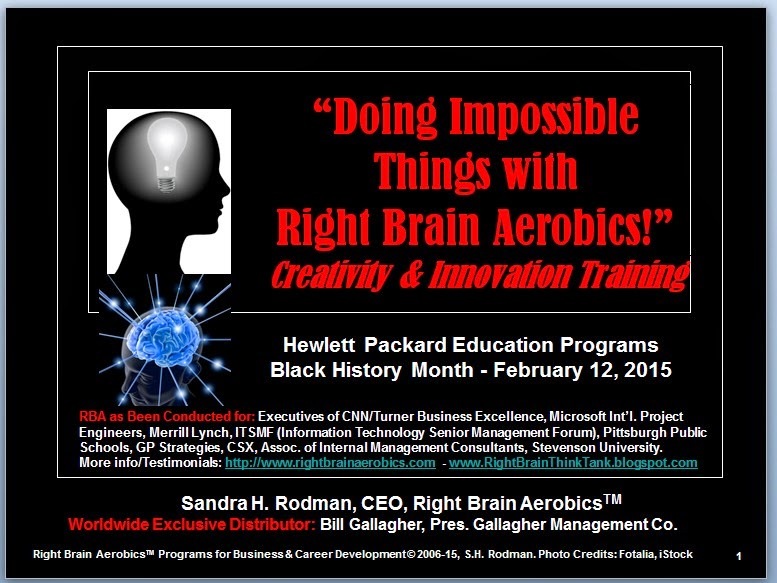 PLUS: PDFs of Right Brain Aerobics Training Slides Instructions for all Trainees. 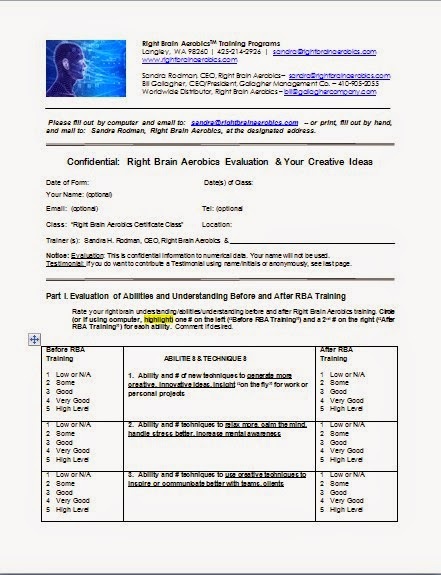 All Trainees who attended experiential Right Brain Aerobics Training also receive PDFs of the Right Brain Aerobics Training Slides Instructions used for that training. Plus: More PDFs/eBooklets available and being developed regularly. RBA EBOOK MANUALS (With Licensing). Almost 600 pages of step-by-step manuals for every exercise -- and for leadership and career development personal training. 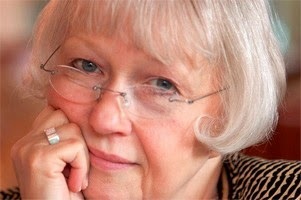 Example: Right Brain Start Up: Guided Audio Exercise, Sandra H. Rodman. Use this Right Brain Aerobics key exercise for deeper "alpha" mind/brain state, concentration to generate more creative ideas "out of the blue." Can also use for stress reduction and deep relaxation. 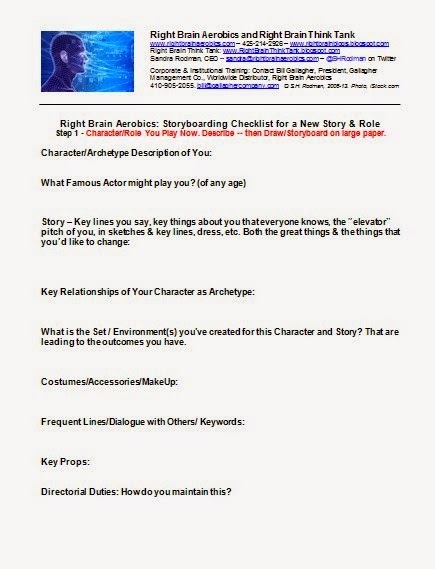 RBA Video Interviews, Samples of Workshop Right-Brainstorming, Self-Training Files. (c) 2015-16, Sandra H. Rodman/Right Brain Aerobics. All Rights Reserved. Confidential and Proprietary. Not for Distribution without Licensing.